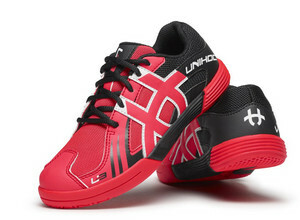 U3 JUNIOR indoor shoe that is perfect for younger players. This model is a younger version of the U3 Power senior offering basic version for younger players, but still remains at the same level as exclusive concerns the processing and the use of technology as well as design. Unihoc U3 JUNIOR Floorball is a shoe designed for stability and motion controls. Ensures maximum comfort in every situation, optimally uses its properties and materials used in manufacturing. Keeps the foot in a stable position and minimizes the risk of injury. Micro Fiber powerful and lightweight mesh technology ensures breathability and comfort. Rubber outsole and molded EVA insole provides comfort and stability on the pitch.